Downsized from his corporate job, Ben Fisher's donning boots and a cowboy hat to try ranching through the holidays on his uncle's spread. 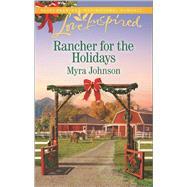 The handsome city slicker turns heads wherever he goesbut he soon begins to fall for one special redhead. Marley Sanders has the work-obsessed bachelor doing the unthinkablevolunteering in the community and dreaming of wedding bells and babies. But his sweet country girl insists she's never leaving Alpine, Texas, and he's set to ride out with the first job offer. Unless Marley can convince him to take the job of her forever cowboy.